A federal district judge in Washington ruled on Friday that a group of nearly 200 Democratic senators and representatives have legal standing to sue President Donald Trump to prove he violated the U.S. Constitution's emoluments provision banning the acceptance of gifts from foreign and domestic interests. WASHINGTON (AP) — A federal district judge in Washington ruled Friday that a group of nearly 200 Democratic senators and representatives have legal standing to sue President Donald Trump to prove he violated the U.S. Constitution’s emoluments provision banning the acceptance of gifts from foreign and domestic interests. The U.S. District Court Judge Emmet Sullivan found that lawmakers have adequately shown that they’ve suffered harm from the president’s alleged violation of the emoluments clause, which prohibit government officials from accepting benefits from foreign governments unless a majority of both houses of Congress consent. The ruling was the second time a federal court judge has decided to advance such unprecedented constitutional lawsuits against the president. 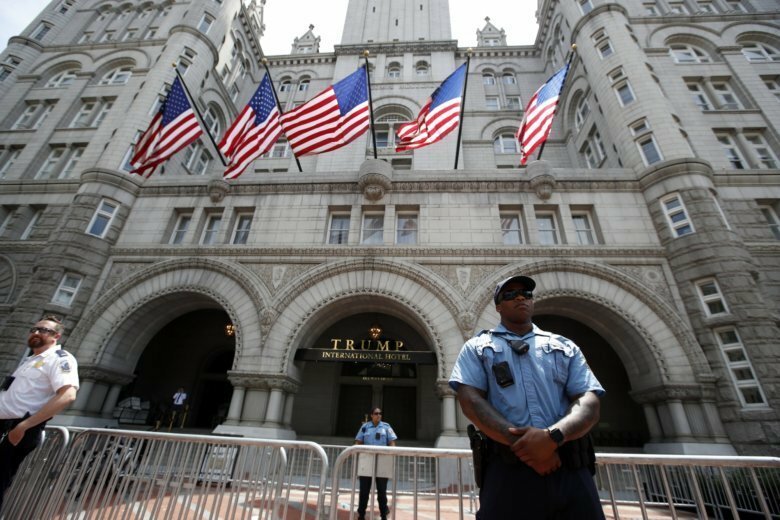 A federal judge in Maryland ruled in July that a similar lawsuit against Trump filed by the attorneys general for Maryland and the District of Columbia could proceed, but only as pertained to earnings from Trump’s Washington, D.C., hotel. Sullivan’s decision Friday only pertained to the issue of legal standing and did not look at the merits portion of the Justice Department’s motion to dismiss. That comes next. The lawyers representing 198 congressional Democrats were led by Sen. Richard Blumenthal, a Connecticut Democrat who, along with his colleagues, have argued that Trump isn’t letting them do their jobs. He praised Sullivan’s ruling. The case argues that the president has received foreign government favors, such as Chinese government trademarks for his companies, payments for hotel room stays and event-space rentals by representatives of Saudi Arabia and Kuwait, and proceeds from Chinese or Emirati-linked government purchases of office space in Trump Tower. Ethics experts say the constitutional emoluments clause was created by the Founding Fathers to ensure that government officials act with the interests of the American public in mind instead of their own pocketbooks. Unlike prior presidents, Trump chose not to divest from his assets and he remains the owner of the Trump Organization, a sprawling business empire with 550 entities in more than 20 countries that include branded hotels, golf courses, licensing deals and other interests. His Washington, D.C., hotel is near the White House and has become a magnet for foreign governments, previously hosting groups tied to Kuwait, Bahrain, Turkey, Malaysia and Saudi Arabia. The District of Columbia case is one of three that argues the president is violating the emoluments clause, but this case is notable because the plaintiffs in this suit — members of Congress — are mentioned in the clause itself. The Democrats’ attorneys have argued that Congress not only has a right but is required, as part of their jobs, to weigh in on potential emoluments to Trump such as a $6.5 million condo purchase by the Qatari government or a Chinese-government owned company’s investment in a project that will include a Trump-branded hotel and golf course in Indonesia. Justice Department lawyers argued in court papers that the Democrats suing the president are not being injured by him at all but by their colleagues in Congress, who have refused to take up the emoluments issue. While the judge acknowledged that the case did raise separation of power concerns, he also noted that “plaintiffs have no adequate legislative remedy” but can be resolved by the judicial process by requiring the president to ask for congressional consent before accepting emoluments. Sullivan’s decision broadens the potential legal peril for Trump and his companies after U.S. District Judge Peter J. Messitte ruled that the emoluments clause lawsuit filed in a Maryland federal court could proceed against Trump. That case, however, is only limited to earnings Trump has received from the Trump International Hotel, which opened in Washington in September 2016. In July, Messitte dismissed the Justice Department’s contention that Trump’s business activity such as hotel room earnings don’t qualify under the constitutional definition of emoluments. The case has moved to the legal discovery stage. The Justice Department, however, has asked for an appeal in that case and for all proceedings to halt until an appeals court rules.